Spike Lee is no stranger to day-in-the-life films, having made one of the greatest of all time, Do The Right Thing, early on in his career. Thirteen years later, he made another: the little-seen yet equally great 25th Hour. The movie was a departure for Lee in many ways. It’s adapted from a novel (Clockers had been his only other literary adaptation up to that point) and features a largely non-black cast. Nevertheless, it feels like one of his most personal films, and could be his most deeply felt. Made in the aftermath of 9/11, 25th Hour isn’t as angry or self-consciously button-pushing as Lee’s earlier works—it’s conciliatory and heavy with regret. The main character, played by Edward Norton, is a high-end drug dealer about to go away on a seven-year prison sentence, and the film documents his last 24 hours of freedom. He visits his distraught father (Brian Cox), a retired firefighter-turned-bar owner, then spends the rest of the day with his young Puerto Rican girlfriend, Rosario Dawson, two career-focused childhood buddies (Philip Seymour Hoffman and Barry Pepper), and his motley mutt, Doyle, whom he finds near-dead at the beginning of the film and adopts. The baby-faced Norton might not seem ideal casting for a drug dealer, but his Monty is one those upwardly mobile criminals who’s had plenty of opportunities—solid middle-class upbringing, good schooling, etc.—but valued them too little to make something better of himself. It’s only now, with the good times over, that he realizes how much he’d taken for granted. The film opens with a startling series of shots of the “Tribute In Light”—those ghostly columns that stood in place of the World Trade Center towers during the spring of 2002—setting the tone for everything that follows. It isn’t just Monty who took his good fortune for granted, Lee seems to be saying, it’s all of us. Throughout the film, 9/11 serves as a sort of omnipresent rebuke. To paraphrase the rueful closing lines of screenwriter David Benioff (who adapted his own novel), the characters are continually reminded how close their lives came to not happening. Yet with the exception of Monty, no one seems particularly eager to change their situation: They'll continue living mostly for themselves, and they'll keep thinking, as we all do, that this is simply how it is and how it must be. Brilliantly, Lee and Benioff end the film with a lengthy, alternate reality: a 25th hour in which Monty runs and starts a new life in Middle America, a better life filled with honest work and family and long-vanished small-town values. It could almost be a parody of the American Dream, except Lee doesn't make fun of this life that never was; he looks on with genuine sadness and longing. 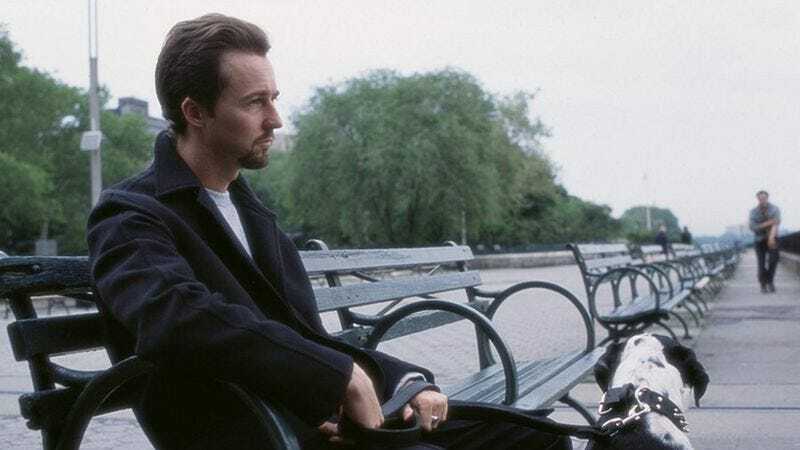 25th Hour is an unusually honest love letter to America, because it's in love not with the America we got, but with the one we didn't.